This butterfly was observed in Rackensack Canyon, Maricopa Co., Arizona, May 2009. It is taking nectar from flowers of Spreading Fleabane (Erigeron divergens). 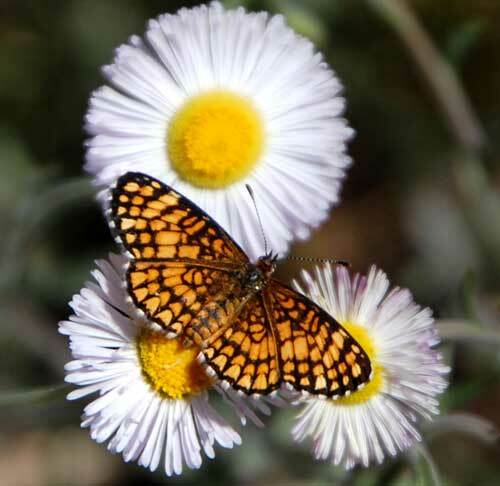 The Elada Checkerspot is a very small butterfly; the wingspan is usually 25 mm or less. The butterfly often flies close to the ground in a languid fashion and so often goes unnoticed. The caterpillar uses several members of the Acanthaceae plant family during the caterpillar stage. Look for it in canyons where there is a relatively good water supply and rarely far from one of its host plants.